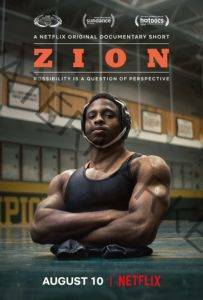 Zion is a gripping portrait of Zion Clark, a young wrestler born without legs who grew up in foster care. Clark began wrestling in second grade against his able-bodied peers. The physical challenge became a therapeutic outlet and gave him a sense of family. Moving from foster home to foster home, wrestling became the only constant thing in his childhood. The Netflix original documentary short is directed by Floyd Russ. If you like what read about Zion, please remember to share Netflix New Releases on Facebook, Twitter or wherever you guys want it’s all appreciated.